Note: All the links in the answers open in separate browser windows so you won’t lose your place on this page. - What are the loft degrees? - How do I change lofts? - Why can't I just move the dial straight to the loft I want? - Is there really an advantage to half lofts? - Is the black lever durable enough? - Do I need to re-align the black lever? - Do the teeth and threads ever wear out? - Do I need to lubricate the transmission? - How does the shaft lock (extend) and unlock (collapse)? - Is the shaft as solid as a one-piece shaft? - Is the shaft's extended length adjustable? - What lengths do you offer? - What is the collapsed length? - Is the shaft as durable as regular clubs? - Can I get a non-collapsing one-piece shaft? - Can I install my own shaft? - What is the flex of the shaft? Can I choose a different flex? - Can I get a telescopic graphite shaft? - Is the Whole-In-One Adjustable Golf Club “legal" for tournament play? - Can I select my own font and background colors for my name? - How well does the Whole-In-One putt? - Can I really drive with the Whole-In-One? - What is the lie angle? - What kind of grip comes with the club? Can I change it? - Has the Adjustable been tested with a robot machine? - Are there any other adjustable clubs out there? Any competition? - Can I get a left-handed Adjustable club? - How can I know if I like the club before I try it? - Do you supply Adjustable clubs at a discount for fund-raising events or golf tournaments? - Can I carry my Whole-In-One Adjustable Club on airplanes while traveling? - Do you have an Affiliate or Rep program? What are the loft degrees? The accompanying chart shows the degrees for the lofts that correspond to the lines and the spaces. You can also lock the head on half-lofts (not shown in this chart) when you lock the head just above or below the lines. Half-loft settings are every 2 degrees, while traditional whole lofts are 4 degrees apart. *Typical putters have 4 degree lofts. But you can set the Whole-In-One to -2, 0, 2, 4, 6, 8 if you like. When would you want to do this? You probably wouldn't want to set it to a 0 or negative loft, but if you are on the fringe, you can set it to 6 or 8 so it gently lifts the ball across the fringe and then rolls out smoothly. **There are several sand or lob wedge settings. The first mark is 52 degrees, the second is 60 degrees, and you can continue to ratchet and lock the head up to 70 or more before the face gets so flat that it can slip under the ball without moving it. It is a lot of fun when you set it on 70 degrees or more and take a full swing from just a few feet away from the green and flop the shot right next to the pin where it can stop like a rock. This is especially helpful when you need to lift the ball over a tree, bush, or trap to a close pin. How do I change lofts? Stated simply, you unscrew the lever one turn, then ratchet the head back and forth until the arrow on the head lines up with the loft on the hosel. Please click here for full adjustment instructions and to learn how to "speed shift". Why can't I just move the dial straight to the loft I want? The reason you can’t just “go to the desired loft” is because the size of the transmission doesn’t allow it. Each traditional loft is 4 degrees apart. 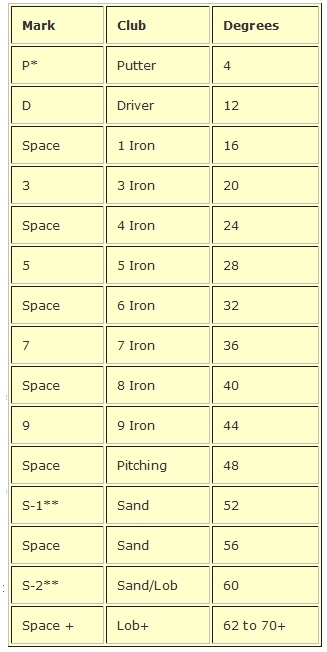 As an example, a 4 iron is typically about 24 degrees of loft and a 5 iron is typically about 28 degrees. There are 360 degrees in a circle. 360 degrees divided by 4 degrees = 90. That means it would require a gear with 90 teeth in order for each “click” to have its own locking loft position. But 90 teeth would require a gear-face that is at least 2 inches in diameter in order for the teeth to be deep enough to lock and hold during impact. That size of device would be great for chopping wood, but way too large and heavy for a golf club. To solve this challenge, we invented a ring gear vernier transmission which has a different number of teeth on each side that are angled to ratchet in opposite directions. There are 20 teeth on one side of the gear, and 18 teeth on the other side. 360 divided by 20 teeth = 18 degrees. 360 divided by 18 teeth = 20 degrees. That is a 2-degree differential which is half a loft. So every time you rotate one click, then rotate back one click in the opposite direction, it ADVANCES 1/2 loft. It doesn’t matter if you click up-and-down or down-and-up. Our right handed clubs always ADVANCE half a loft with each PAIR of clicks. Left Handed clubs DECREASE half a loft with each pair of clicks. So not only does the ring gear allow us to miniaturize the transmission to fit the size and weight of a golf club, it gives us half lofts as a bonus. You are not limited to back-and-forth pairs of clicks. Click here to read about “speed shifting”. Is there really an advantage to half lofts? Half-lofts are definitely an advantage, especially for non-professionals. Normal clubs hit in 10 yard increments. In other words, if you hit a 7 iron 160 yards with a full swing, you will probably hit an 8 iron 150 yards with a full swing. Until now, the only way to hit it 155 yards was to adjust your swing speed and/or shorten your back-swing. Pros do it all the time...and they practice it diligently. But with the Whole-In-One, you can set it to half lofts, take full swings, and hit every 5 yards. Full swings are always easier to repeat, so there is a distinct advantage in half lofts, especially for players with high handicaps who don't have the professional skill to hit less than full swings. Is the black lever durable enough? Yes. It is made of glass-filled nylon which is super-durable. The lever presses over a Grade-8 nut which is what takes all the abuse and locks down the mechanism. The ultra-strong, ultra-light weight black nylon lever provides the necessary leverage to tighten the nut. Do I need to re-align the black lever? Yes. The lever is factory-aligned so that when tight, it is approximately parallel to the face of the club as shown in the instructions. Note that it aligns with the face, not with the shaft which varies with the loft positions. After you use the club for a while and the transmission teeth and threads break in (smooth), they effectively fit closer and closer together, and the lever alignment will progress past the face when tight. You will then want to re-set the lever alignment as shown in the instruction link above. Do the teeth or threads ever wear out? No. The teeth and threads are very durable 17-4 stainless steel. They are only passing each other during the adjustments. They are not moving during the swing, so there is no force or wear on them during contact. Once they get "polished" and smoothed from initial use, they do not continue to wear. The threads are never being tightened nearly as much as with a wrench. The black lever is only ½” long, so it does not impart very much torque to the threads. However, if something was ever going to wear out, it would be the nut which is slightly less hard than the threads on the head. This is by design because a replacement nut is only about 10 cents at a hardware store. If anything ever does break, we will fix or replace it at no charge, no matter how long you have had your club. Do I need to lubricate the transmission? As noted in the instructions, we recommend putting some type of oil into the gears from time to time. In most cases, they perform flawlessly dry. The more important thing is to lubricate the threads and the spring. This is as simple as unscrewing the lever 1 or 2 turns and shooting some WD-40 or similar lubricant into the spring area. It will also penetrate the threads. I do that after every round and recommend it for everyone. How does the shaft lock so solidly? We make our shafts so that the sections lock within themselves using a "machinist's taper". In other words, the inner and outer layers form a perfect male and female locking fit. By definition, a machinist's taper requires more force to unlock or "disengage" than to lock. It is how cutting bits are fitted into machine shop tools which is more solid than a traditional drill chuck.. These bits can withstand enormous twisting force without loosening. A machinist's taper is more secure than splines, pins or threads. Simply stated, there is no other way of fitting metal to metal that is stronger or more solid. When applied to a golf shaft, it maintains the torque and flex that is necessary for optimal performance. 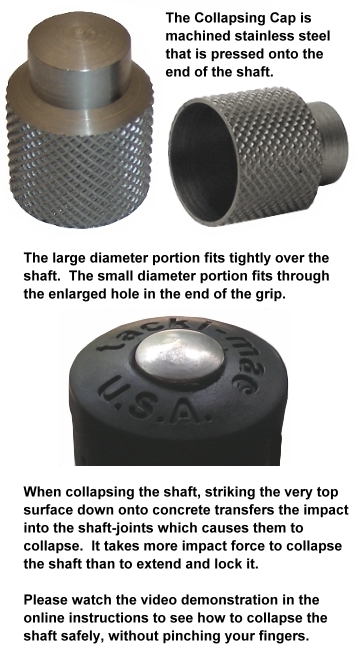 Not only would pins, splines, or threaded couplings be less stable, they would interfere with the performance because of the weight and how they would negatively affect the torque and flex...critical elements for golf clubs. To extend and lock the shaft, you merely pull it apart with a brisk motion as described and shown here. To collapse it, strike the stainless steel cap that extends through the end of the grip onto concrete. The shock of that impact transfers directly into the shaft and disengages the machinist's taper. It won't come loose from swinging or ball contact. It must be struck DIRECTLY upside down into a solid surface. The machined stainless steel caps are pressed onto the end of the shaft. Therefore, there are no additional knobs, grooves, or secondary locking mechanisms that would interfere with the feel, weight, flex, and torque of the shaft...all of which are critically important to a golf club's performance. Is the shaft as solid as a one-piece shaft? Yes. It is absolutely rock-solid. There is no rattle or movement. This is understandably difficult for people to believe. When we are out on the course or at a demo-day, we often let people hit the club without telling them it is a collapsible shaft. They are amazed at how solid it is even with the multiple parts in the head. Then we show them how the shaft collapses, and their mouth drops open. The “solidness” of the shaft seems to amaze people more than adjustability of the head! Is the shaft's extended length adjustable? No. The shafts are "telescopic" but not "adjustable for length ". In other words, they are either fully extended and locked, or collapsed for travel or storage. The playing length is not adjustable, other than your ability to choke up or down on the grip. An adjustment mechanism in the middle of the shaft would cost a lot more, and would diminish the performance of the shaft by interfering with the weight, flex, torque and feel. We actually have prototyped adjustable mechanisms, but the cost and negative affect on performance is too great. Various adjustable length putter shafts have been offered by some companies over the years, but even with the limited motion of a putter, any minor movement in the adjustment mechanism throws off a putt. They have never become a commercial success. Imagine the forces it would have to withstand with a full swing club. 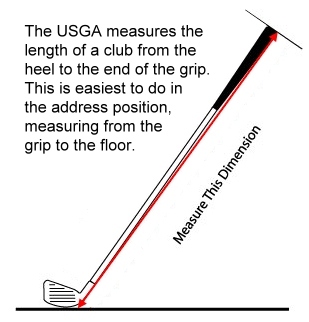 Length refers to the "overall " length of the club, from the end of the grip to the bottom heel of the head which is how the USGA measures club length. We have two standard lengths. The 38.5 inch model (97.8 cm) is typically for players 5ft 8in (173 cm) or taller, and the 37 inch model (94 cm) is for players who are shorter than 5ft 8in. If you are "about" 5ft 8in tall and are not sure which length to order, we recommend the 38.5" model if you are a good player, and the 37" if you are a beginner because shorter clubs are easier to control. We also offer shorter and longer lengths in 1/2 inch (1.27 cm) increments for an additional $20. We don't officially recommend longer, even if you are a tall player and your full set is extra long. With a longer shaft, the swing-weight is heavier and the flex and torque (twist) increases so it becomes very difficult to take advantage of a longer shaft and to deliver the head to the ball consistently. Also, even very tall players have similar measurements from their wrists to the ground, so tall players don't necessarily need longer clubs. This is especially true with our Adjustable since the standard 38.5" length is longer than most of the clubs in a full set with extra long shafts. That said, we do offer a 39 inch (99 cm) for an additional $20, or a 39.5 inch (100.3cm) and 40 inch (101.6 cm) for an additional $40 since those lengths require custom-machined extensions. Note that custom length costs are not covered in our satisfaction guarantee. It usually takes one business day to build the custom length, and we ship on the following business day. As described on the Disadvantages page, another factor when considering longer lengths is that the lie angle of our adjustable loft club is steeper than most irons because it is "half way between irons and a putter" since it is used for everything. So on the lower loft settings, the toe will be up a little. When putting, the heel will be up a little. If you get a longer club, the toe will be up all the more. Some customers have incorrectly assumed that since their driver is 44 inches or longer, they want a longer Divnick Adjustable shaft. But a driver lie angle is flat enough so that the head sits level on the ground in the address position. The Divnick Adjustable won't do that because of its compromise lie angle. So that is another reason that we don't recommend longer lengths. The Divnick Adjustable Loft Club has a 3-piece shaft which collapses to 17 inches from the bottom of the heel to the top of the grip. I easily fits into standard carry-on size luggage...but until the TSA changes their policy against carrying on golf clubs, you will need to check it in USA flights. Of course, including it in one checked bag is a LOT less expensive than paying for a second bag. Click here to read more about that. Is the shaft as durable as regular clubs? Yes. Because nothing is moving during the swing, there is nothing wearing out. In the 20+ years we have been making this club, we have NEVER had a shaft wear out. And we have customers who play daily with this club, and collapse it between every round. Can I get a non-collapsing one-piece shaft? No. For a number of practical and performance reasons, a traditional one-piece shaft does not work in this club. The club is designed to use a 3-piece shaft with overlapping sections. The resulting flex is perfect for this club. A one-piece shaft would be too flexible. Some people ask this question because they don’t plan to use the club for travel and don’t need to collapse it. If that describes your probable usage, just leave it extended. Please click here to read more details about this question and why a one-piece shaft will not work in this club. Can I install my own shaft? For the same reasons as noted above and on this page, we do not offer our Adjustable club without our matching shaft in it. What is the flex of the shaft? Can I choose a different flex? The flex is considered "Regular". Because of the sections and machining that is required to make the telescopic shaft, we are not able to offer variable flexes. Can I get a telescopic graphite shaft? All telescopic shafts are carbon steel. Graphite shafts cannot, under any circumstances, be made telescopic. The wall thickness of graphite shafts is MUCH thicker than steel shafts, so the inside and outside dimensions won’t allow the smaller (lower) shaft sections to fit through the upper (larger) sections. Also, linear durability of graphite shafts is severely degraded with any cuts or nicks. The lower end of the outer shaft section would separate if it could be made to telescope. How do I measure a club's length? Note that the club length is not the same thing as the shaft length. The club length is the TOTAL length of the shaft plus the head, or at least that portion of the head below the bottom of the hosel. The easiest way to measure a club's length is to place the club in the address position with the head on the ground or floor, and place a measuring ruler or tape along the back of the shaft, from the floor to the end of the grip. It is easiest to have someone help you with this...to hold the club while you measure. Because of the variables of getting the end of the tape exactly on the ground at the precise intersection of the heel, being exact is difficult, but it will get you within 1/4 inch which is fine for non-professionals. Because of these variables, we are part of the group of golf club manufacturers who are trying to get the USGA to change the way they measure clubs. It would be much more accurate to measure the way the Long Drive Association (LDA) does it...by standing a club up against the wall and measuring from the floor to the end of the grip. This would include the head no matter how large or odd-shaped it was, and make length a more reliable measurement. But until then, we are following the USGA method. Is the Whole-In-One Adjustable Golf Club “legal for tournament play? Because it has moving parts, it does not confirm to the USGA Rules of Golf. However, it is usually OK to use it for charity tournaments. Click here for more details and some interesting responses. Can I select my own font and background colors for my name? Yes. Our standard font is Arial yellow, and the background is bright blue that fades to black around the edges as shown in this picture. There are some other samples here. If you want a different color font or background, please specify in the Comment box during checkout on our secure order page. However, we strongly recommend that whatever background color you use, that it fade to black around the edges which helps prevent discoloration from moisture that seeps into the edges. Although we use waterproof photo-quality vinyl paper, the edges can absorb moisture, and that shows on lighter colors. For your reference, we use Microsoft Word colors and fonts. If you want all caps, please specify. How well does the Whole-In-One putt? Some people love how it putts, others don’t like it at all. It is the most “unlike” a putter as compared to all the other clubs. Although it has white alignment lines, it is like putting with an iron that has a standard 4-degree putter loft. That is why we also offer telescopic putters…for those who want portability, but just can’t stand the idea of not having a traditional putter blade, weight, and length. Please see our full page of “Disadvantages”. We want you to be fully informed. Can I really drive with the Whole-In-One? Yes...with an explanation.. It is like driving with a 4-iron off a par 3 tee. Since it is a 4-iron length, there is no advantage to setting the loft lower than a 4. Even though it has a “D” for a 12-degree driver loft, all that does is require a more dead-center hit. The lower the loft, the smaller the sweet spot. Because it is a 4-iron length, it does not generate as much club-head speed as a driver, so it does not hit as far. Just as with the putter, that is why we also offer a telescopic driver option. RECOMMENDATION: Use the forward tees so you can still reach the green in regulation. Make it a fun round that will provide lots of opportunities for pars and birdies. What is the lie angle? “Lie Angle” is the angle of the head to the shaft as shown in this picture. A perfect lie angle is when the score lines are parallel to the ground. With a full set of normal clubs, the lie angle decreases (gets flatter) for the longer-shafted clubs because the head is farther away from your feet, and it increases (gets steeper) for the shorter clubs as the head is closer to your feet. Putters have the steepest lie angle, drivers have the flattest. Since our Adjustable Loft Club is used for everything, it has a 64-degree lie angle which is somewhat between a putter and irons. So you will notice that the heel is down and the toe is up a little when set to the lower lofts, and the heel is up a little while putting. Based on our robot machine tests and many years of player feedback, this does not have a significant impact on the flight of the ball, so it is just something you'll notice at first, then get used to. But the lie angle is one of the reasons we don't recommend longer shafts than our standard 38.5 inch model, and why we DO recommend shorter shafts for shorter players. Said another way, the shorter the player, the closer their hands will be to the ground resulting in the heel being lower and the toe being up for the longer iron-loft shots. This is solved by selecting a shorter length which naturally brings the head closer to your feet which makes the score lines more parallel to the ground. What kind of grip comes with my club? Can I change it? We ship our clubs primarily with a Tackimac black grip pictured here. There are rare times that we substitute an alternate grip depending on supply. Tackimac grips never lose their tacky feel and are the most durable grips in the golf industry. If you want a custom or other name-brand grip, you can send us a grip and we will install it on your club at no additional charge. Or, you can remove our grip and install your own at any time. Just drill out the hole in the end of the grip so our collapsing cap can extend through. The size of the bit depends a little on the type of grip material and how much it stretches while being drilled. We use a 15/32" bit for the Tackimac grips which have a harder end-material than most grips. We recommend that you start with a 3/8” bit. You can always go larger if need be. Click here to see the entire collapsing cap. Has the Adjustable been tested with a robot machine? Yes, we have had two robot tests done with amazing results. Please click here to read the full summary. Are there any other adjustable clubs out there? Any competition? Yes. Please click here to see a full report on the comparisons. Can I get a left-handed Adjustable club? Absolutely. Click here to place your order for immediate shipping. How can I know if I like the club before I try it? Even though we have many reports and testimonies for you to read, we don’t think you should decide whether or not you like the club until after you have given it a full test, including an actual round or two. Most of our sales are to people who have never hit the club before, but our satisfaction return rate is less than 1%. That is an amazing statistic for a product that people purchase without seeing and testing first. So we are very confident that you will love the club. But there is no way for you to be able to agree with that until you have given it a thorough hands-on evaluation. Please click here to read our full guarantee. Do you supply Adjustable clubs at a discount for fund-raising events or golf tournaments? Yes. Please click here for details. Can I carry my Whole-In-One Adjustable Club on airplanes while traveling? Not in America at this time. Since the terrorist attack in New York on 9-11, the Transportation Security Administration does not allow golf clubs to be carried on commercial airplanes. We are continuously lobbying with them to change that rule using the argument that golf clubs would not be used as a weapon since there isn't enough room to swing them, in addition to other logical arguments . However, now that airlines are charging for checked bags, traveling with a Divnick Adjustable and other telescopic golf clubs is MUCH less expensive than a full set. Click here for more about this topic. Do you have an Affiliate or Rep program? Yes, we do have a Rep program. Our customers become our best advocates and quite a few of them become Reps and make a profit while showing people their Whole-In-One. Click here for more details. Do you have any other questions? If so, please don’t hesitate to ask. Earn the entire cost back just by showing it to your friends and people you meet on the course! Most of our sales are a result of satisfied customers telling their friends and demonstrating it on the course (it's a great way to pay for your green's fees!). For every new golf club customer that you refer to us during the first year, we will send you a $25 rebate! It is our way of saying thank you for spreading the word. Just ask them to type your name in the Comment Box when they place their order. Be sure to check out the 5' long BIG STIK with the massive DOUBLE-SIZE head! It can hit the ball out of sight! Of course, it is COMPLETELY ILLEGAL! If you participate in any charity golf outings, we have a turn-key package that easily raises over $1,000 using this club on one of the holes where everyone gets to try it. Thank you for helping to spread the word to charity golf outing planners, and to local course pros who interface with those outing people.